Foreign Minister of Azerbaijan Elmar Mammadyarov and Foreign Minister of Argentina Jorge Faurie had an exchange of congratulatory letters on the occasion of the 25th anniversary of diplomatic relations between the two countries, said a message from Azerbaijan's Foreign Ministry. In his letter, Minister Elmar Mammadyarov congratulated his counterpart Jorge Faurie on the occasion of the 25th anniversary of the establishment of diplomatic relations between the Republic of Azerbaijan and the Republic of Argentina. Elmar Mammadyarov noted that the past two and a half decades have witnessed an ever expanding cooperation between Azerbaijan and Argentina across many areas, particularly bilateral political dialogue, economic and trade ties and cultural exchanges. Minister Elmar Mammadyarov expressed his appreciation for Argentina’s sustained support concerning the settlement of the Armenia-Azerbaijan Nagorno Karabakh conflict within the principles of sovereignty, territorial integrity and inviolability of internationally recognized borders of Azerbaijan cemented by the UNSC resolutions 822, 853, 874, 884 of 1993. 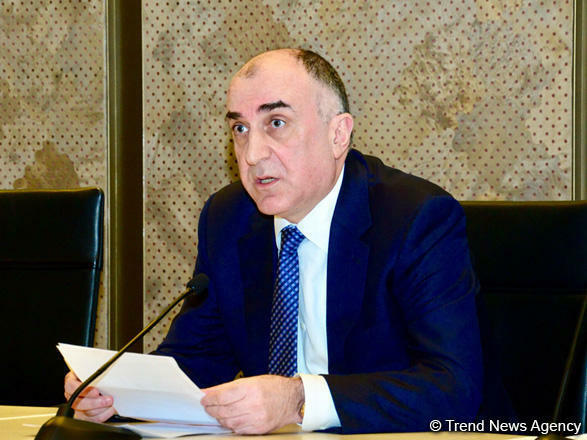 At the end of his letter Minister Mammadyarov expressed his confidence that both sides will continue to build further on mutual achievements and explore all avenues to fully realize the existing potential for cooperation. Minister of Foreign Affairs of Argentina Jorge Faurie congratulated Foreign Minister Elmar Mammadyarov in his letter on the occasion of the 25th anniversary of the establishment of diplomatic relations between Azerbaijan and Argentina. The importance of the Agreement signed in Moscow on November 8, 1993, was mentioned in terms of deepening of relations between the two countries. The letter also highlighted the visit of the Azerbaijani delegation to Argentine to participate at the 4th political consultations between the two countries. At the end, Argentina's Foreign Minister Jorge Faurie expressed his assurance that both sides will spare no efforts to further develop bilateral relations for the sake of the welfare of the two peoples.